Seabourn took the first public step toward building a new ship today when Carnival Corp signed a letter of intent to build the ship with Fincantieri in Italy. CND subscribers also read about some benches being just as good as a pier ... and doggie bathrooms. MIAMI (Oct. 18, 2013) – Carnival Cruise Lines has appointed Rear Adm. Roy A. Nash, who recently retired from the U.S. Coast Guard, to the company’s Safety & Reliability Review Board. The line announced the development of the board in April 2013 and Nash becomes the fifth external member of the board, joining experts with extensive leadership, operational and maintenance experience within the U.S. Navy and airline industry. A part of Carnival’s comprehensive fleetwide technical enhancement program, the review board was created to provide independent third-party perspective and to drive continuous improvement across the line’s fleet. The core objectives of the board are to review Carnival Cruise Lines’ current policies, practices and performance, and to guide the company in incorporating best practices from other relevant fields and industries. Rear Admiral Roy Nash recently completed his career as Commander of the Eighth Coast Guard District in New Orleans. He was responsible for port safety and security, commercial vessel safety, and response operations across the U.S. Gulf of Mexico. His duties included 10,300 miles of the Mississippi, Missouri and Ohio rivers. RADM Nash was previously assigned as Deputy Federal On Scene Coordinator for the nation's response to the Deepwater Horizon oil spill, impacting five Gulf Coast states. He commanded field units, serving as Captain of the Port, advancing maritime safety, security and environmental protection. He commanded the Marine Safety Center, the Coast Guard's technical center reviewing design, engineering, and fire safety plans of commercial ships, tank barges and mobile offshore drilling units. Nash initially served in engineering positions afloat, on staff, and as marine inspector, investigator and environmental responder. Rear Admiral Nash holds a master of science degree in Fire Protection Engineering from Worcester Polytechnic Institute and a bachelor of science degree from the U.S. Coast Guard Academy. He was awarded the Distinguished Service Medal, Legion of Merit, and Meritorious Service Medals, among other awards during his 34-year career. "Rear Admiral Nash brings a wealth of knowledge and experience to the board and will work together with other members to position Carnival Cruise Lines as an industry leader in operational best practices," said Gerry Cahill, president and CEO of Carnival Cruise Lines. "Our new technical, safety and reliability initiative is designed to ensure we're going above and beyond in all areas of technical operations." Princess Cruises said today that construction of Regal Princess has been progressing very well, and they have decided the new ship can debut 13 days earlier than anticipated. During that time, Princess will add a 13-day round trip from Venice to Athens, which can be booked either in its entirety or as either the six- or seven-night segment. Get plenty of champagne ready, because Norwegian Cruise Line is planning another gang christening for their newest ship, Norwegian Getaway when it arrives in Miami. The line has chosen the Miami Dolphin Cheerleaders as godmothers for the new ship. CND subscribers also read about storms in the Atlantic delaying Disney Magic ... and a strike by longshoremen in Baltimore. Seattle, Wash., Oct. 17, 2013 — Holland America Line has appointed Sibrand Hassing to director, nautical operations Europe, based in the company’s Rotterdam office in the Netherlands. In this role, he will be responsible for the safe operation and nautical oversight of the premium cruise line’s 15 Netherlands-flagged ships and act as a local liaison with the Netherlands Shipping Inspectorate (NSI), which has oversight for ships registered in the Netherlands. Hassing will report to Cees Deelstra, vice president, nautical operations. He is taking over from Leo Dobber, who is retiring after 10 years with Holland America Line. Hassing joined the Netherlands’ Ministry of Infrastructure and Environment (formerly the Ministry of Transport) in 1992, most recently serving as senior policy advisor for the division of shipping and security. 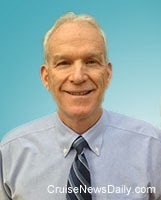 During his tenure there, Hassing was involved in many policy issues, including International Safety Maritime Code, air emissions, navigation safety, Port State Control and Standards of Training, Certification and Watchkeeping. He also was a regular participant at International Maritime Organization meetings and served as delegation head on several occasions. In 2010, Hassing served as vice chair of the STCW meetings in Manila, Philippines, where a significant number of amendments were adopted to improve processes and safety. As an IMO lead auditor Hassing participated in compliance audits for IMO member states. Hassing has more than 10 years of deck officer experience, including time with Incotrans, the former Holland America Line cargo department, and aboard various LASH, offshore supply, container and ro-ro ships, where he rose to the rank of chief mate. Port Canaveral seems poised to grow again. The port says they are in advanced negotiations with one to three major Miami-based lines each to homeport a ship at Canaveral, and they are hoping to sign two of them by the end of the year. To have a place to put a couple of new ships, the board began discussing building another cruise terminal on the port’s south side. 14 October 2013 - The RCL Cruises Ltd new UK and Ireland business structure is taking shape with the appointment of hospitality and leisure industry veteran, Stuart Leven, to the role of managing director of Royal Caribbean International. International, Celebrity Cruises and Azamara Club Cruises. Plus he continues in his role as managing director of RCL Cruises Ltd.
Stuart Leven will work alongside Jo Rzymowska who will lead the UK and Ireland Celebrity Cruises business. Both roles are new, and follow the announcement that the UK and Ireland office is creating three dedicated businesses for Royal Caribbean International, Celebrity Cruises and Azamara Club Cruises in response to the significant market growth achieved. Leven brings a 20-year track record in the leisure and hospitality industry including airlines, travel agencies and hotels to the Royal Caribbean International UK and Ireland business. He has held senior roles in businesses such as IHG, Thistle and Guoman Hotels, Choice Hotels Europe and KLM. Royal Caribbean International, Azamara Club Cruises, and Celebrity Cruises are currently recruiting for additional sales and marketing roles created by the move to dedicated teams for each brand, which will be in place by January 2014. Operating each of the three cruise lines – Royal Caribbean International, Celebrity Cruises and Azamara Club Cruises – as individual businesses is an important milestone in the history of the overall global organisation. It is the first time that outside North America any of the brands will enjoy such commitment, focus and investment. RCL Cruises Ltd operates Royal Caribbean International, Celebrity Cruises and Azamara Club Cruises in the UK and Ireland. Together this is 34 of the world’s most innovative and design-led cruise ships. For more information please visit www.royalcaribbean.co.uk, www.celebritycruises.co.uk or www.azamaraclubcruises.co.uk. Travel professionals please visit www.cruisingpower.co.uk. 15 October 2013. Today in Rome, at the official residence of the Italian President, the Palace of Quirinale, President and founder of the MSC group Gianluigi Aponte was awarded the Order of Merit for Labour (Ordine “Al Merito del Lavoro”) by Italian President, Giorgio Napolitano, for his remarkable achievements in international shipping over the last 40 years. The MSC group today represents a global empire that dominates in not just one shipping sector but several, representing the second-largest container carrier in the world - employing about 50,000 people and operating a fleet of 460 cargo vessels that serves 200 ports across five continents – and the world’s largest privately owned cruise company, MSC Cruises. Despite its spectacular growth, MSC is still a family-owned business and its founder remains dedicated to the company and to his family. Carnival Corp has signed a five-year contract with Harris CapRock Communications to provide communication services across their 10 brands containing more than 100 ships. What do you care? Harris CapRock says it will provide “dramatically improved bandwidth levels,” which will deliver improved internet speeds to passengers and crew, closer to the experience they have at home. The new owners of Queen Elizabeth 2, QE2 Holdings, have finally taken a step in the ship’s development as a floating hotel, but there are lots of important steps still unannounced. Next year Diamond Princess is being dedicated to the Asian market. There will be elements brought aboard the ship to customize it to the market. One of them will be a traditional Japanese Bath in the ship's spa. It will have indoor and outdoor bathing areas designed to offer the serenity of a classic Japanese spa. This video will give you a preview of the feature which will debut in April 2014. Carnival Cruise Lines said today that they’ve listened to their travel agents, and in response they are simplifying fares so they will be easier to understand. The new fare structure will reduce fares from six fare types to three. 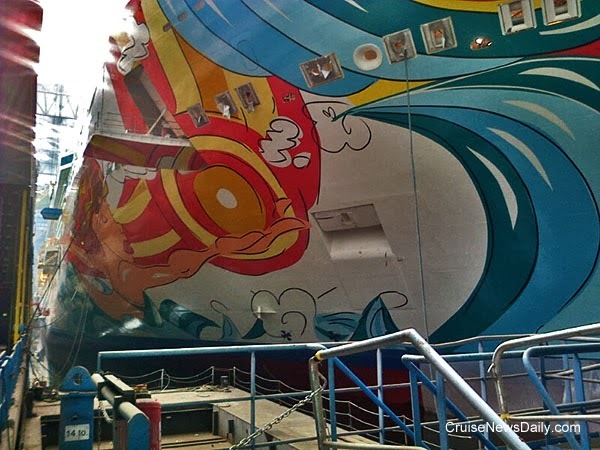 Application of the hull art on the starboard side of Norwegian Getaway has been completed at Meyer Werft in Papenburg (Germany). The tropical ocean theme of the artwork by Miami artist David “LEBO” LeBatard features a mermaid holding the sun, pelicans and palm trees.